The Essential EA Toolkit is a four-part blog on some recommended "tools" for Enterprise Architecture Teams. By "tools" I mean a few well-executed deliverables or processes that contribute enormous value to an organization. These are not technology focused, requiring only standard office productivity software and perhaps a collaboration application such as SharePoint. A Strategic Blue Print and an Enterprise Roadmap. This post examines the second, which is actually two items that work together - a Reference Architecture and a Standards Repository. These tools facilitate both delivery of architecture and governance against it - both common functions of an EA Team. A Reference Architecture is an anchor for other architecture deliverables; the Business Capability model discussed in Part 1 is an example. If you read that post you already have a feel for what one can do. A Reference Architecture is one or more abstract models describing, organizing and showing the desired relationships between the capabilities of an organization from business, information systems and technical view points. Physically, a Reference Architecture is a combination of models in the various Architecture Domains combined in such a way that they are all consistent, reflect organizational attitudes and are easily understood by the appropriate audiences. The model provides a way to conceptualize and anchor on the components of an architecture so that "everyone sings off the same sheet of music". Note that there are a limitless number of ways to model a Reference Architecture. Each model must be suited to a purpose. 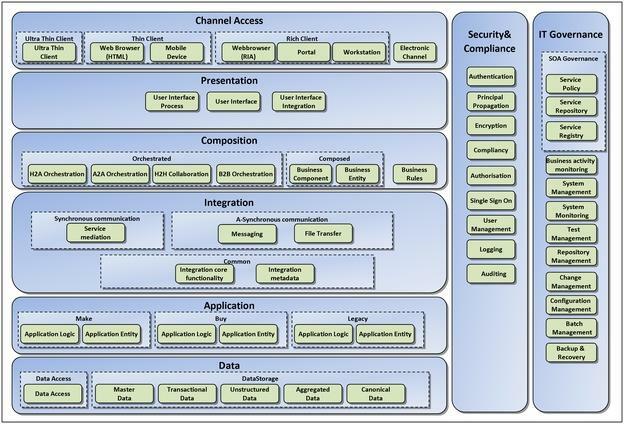 The CORA model is really useful as a reference for creating Information System views of architecture; by that I mean descriptions that focus on high level data and application integration capabilities. The "top" of the model is light on business items (the Business Capability Model discussed in Part 1 is better suited for anchoring business architecture, for example) and the "bottom" is light on technology infrastructure (servers, storage, networking, etc.). As an alternative to CORA, The Art of Enterprise Information Architecture: A Systems-Based Approach for Unlocking Business Insight from IBM provides an "information services" based Reference Architecture that focuses on describing architectures as composed of information services. Reference Architectures are useful in two ways. First, and most obviously, its elements serve as a basis for other architecture deliverables. For example, one can create an Integration view of a solution architecture that includes specifics on how data flows between components via messaging protocols. The components in this application architecture model are lifted directly from or refer back to a Reference Architecture model. Using the same model, the Technology Architecture team can create an architecture describing how messaging services are implemented through various technology components. Since both use the same Reference Architecture, the application and infrastructure architects have a common basis for understanding the design. Finally, Reference Architectures are a great way to identify and classify standards. Architecture Standards are necessary in order for decision makers to assess a potential investment or technology alternatives and make the right call. A Standards Repository stores the Standards such that they are organized logically and available for Governance.